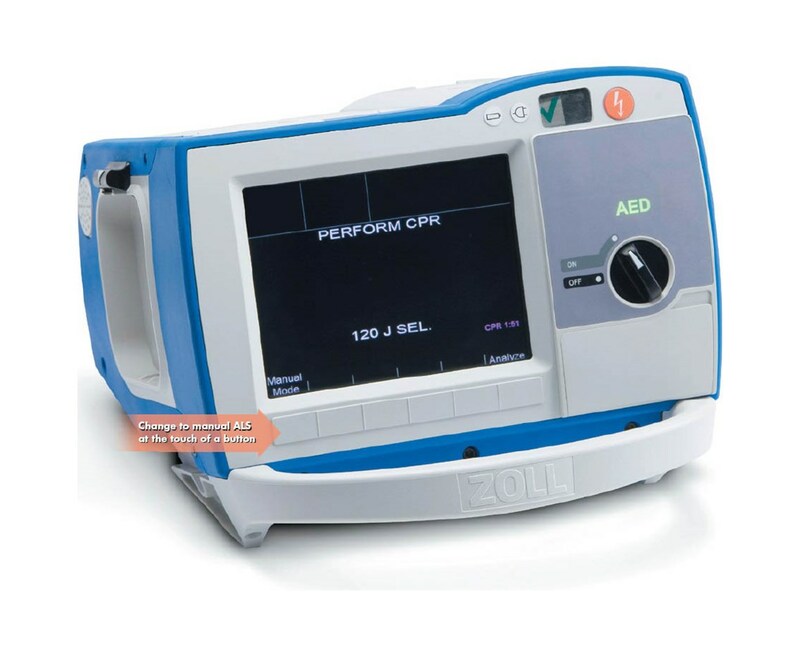 The Zoll R Series BLS Hospital AED/Defibrillator, the world's first Code-Ready® defibrillator, is an affordable, customizable, basic resuscitation device recommended for use in hospitals. When seconds count in life-and-death situations, it is imperative to have a defibrillator that is always ready and simple to use. The BLS monitor features a manual override switch to function as two full-featured devices with the push of a button: an AED, for laypersons and first responders, and a manual defibrillator for qualified users. In addition to high-quality defibrillation, the R Series provides Real CPR Help® to ensure that critical CPR is given correctly for optimal resuscitation efforts. Real CPR Help® coaches responders to perform CPR correctly with real-time feedback, prompting users to begin compressions, push harder, and continue CPR, along with messages confirming that the CPR is being done effectively. It displays compression depth, compression rate, and lapse time indicators to ensure that CPR is consistent, properly timed, and deep enough; it also combines all three compression functions into the CPR Index™, one visual indicator that allows users to view the quality of their CPR efforts and adjust as necessary. Audio prompting urges users to "push harder" and "continue CPR," and exhorts "good compressions" when CPR is done correctly. The monitor is also capable of transmitting CPR data for review and playback of resuscitation efforts. The R Series defibrillator is always code-ready, performing automatic self-checks daily to ensure that it is always ready when needed; it even tests electrode quality and detects expired electrodes. All R Series units are equipped with an Analyze switch to provide rescuers with a "second opinion." They also feature a pediatric analysis algorithm, activated with the connection of OneStep™ pediatric cables (sold separately) for safe use on children. The R Series includes a built-in Defib Mentor™ for training and familiarity tutorials to refresh users' memories for proper use. 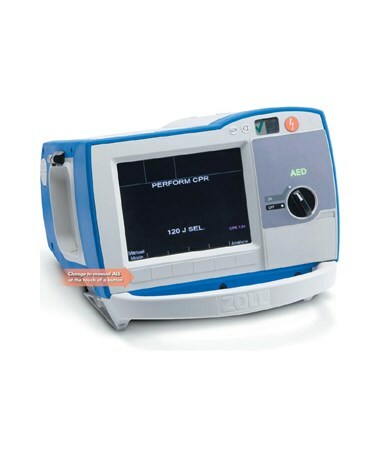 The defibrillator is powered by integrated 120V/60Hz AC power and is compatible with a 5.8 Ah lithium ion battery pack (sold separately) for portability. It includes a built-in test port and compact flash card slot and is guaranteed for 5 years for product quality assurance and peace of mind. When a code occurs, the first people on the scene are not always trained in the administration of manual defibrillation or are hesitant to use a regular defibrillator. The BLS monitor changes from a manual defibrillator to an automatic external defibrillator (AED) with the push of a button, enabling first responders - even laypersons - to defibrillate patients in those first critical moments of the code. When a code team member or more skilled individual arrives on scene, he or she can simply push the button to switch over to manual mode and continue resuscitation efforts. Both modes use the same cables and equipment so there is no need to switch any hardware when changing modes. When the unit includes pacing, it is activated as well when the mode is changed. The R Series BLS is recommended for use in low acuity areas, where the need for advanced resuscitation is not typically necessary. It is fully upgradeable with See-Thru CPR and WiFi capabilities. The R Series is customizable with additional external pacing. Zoll's innovative OneStep™ pacing technology provides half the current with twice the capture for heartbeat regulation with improved patient comfort. The external pacemaker may be temporarily stopped for observation of underlying ECG rhythm. Pacing relies on an external ECG signal and can often be cumbersome and confusing with extra ECG leads and electrodes. Zoll's OneStep™ Pacing electrodes combine ECG monitoring electrodes and pacing/defibrillation electrodes into one hands-free pad, eliminating tangles, confusion, and the need for multiple pads and wires. When ordered with OneStep™ pacing, the R Series includes a OneStep™ pacing electrode, OneStep™ pacing cable, OneStep™ cable manager, and three built-in ECG leads. Use the drop-down menu in the upper right corner of this page to select your desired configuration, then click "add to cart" for hassle-free ordering at the lowest price. Analyze mode for a "second opinion"
Dimensions 8.2" x 10.5" x 12.5"